Research published in the Journal of the American College of Radiology has shown that nearly 10% of chest CT exams report incidental pulmonary nodule findings that meet the Fleischner guidelines for follow-up. Likewise, findings such as adrenal masses, thyroid nodules, kidney masses and liver lesions may require follow-up. The ACR’s Incidental Findings Committee has developed guidelines for these conditions as well. 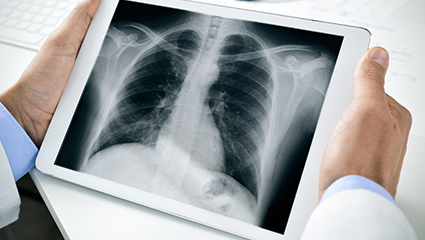 A recent article in Radiology Business highlights some of the problems associated with incidental findings, such as determining patient benefits and the challenge of communicating results. Alarmingly, many of these patients are lost to follow-up. Very often, the primary care physician does not receive all patient studies if he or she is not the ordering physician. Once the patient leaves the ED or IP facility, the studies are usually archived, and – if the attempt to track them is being made at all – the process becomes a manual review for a nurse navigator. It should be no surprise that, according to the same study cited above, 71% of patients with lung nodules detected do not return for follow-up. In this era when so much emphasis is placed on tracking quality measures, the question of who owns the communication and care coordination of incidental findings is of real concern. Addressing this gaping hole in the continuum of care is often dependent on allocation of budgetary dollars or large implementations of new systems. But there’s no good reason to wait when lives are at stake and efficient alternatives are available. Today, new technology in the hands of experienced teams can deliver needed solutions faster and with provable efficacy. track the results of those follow-up exams for comparison and ultimate action on the original finding. Creating such a system will provide benefits beyond good patient care. For the radiology group striving to counteract the forces of commoditization, initiating this type of integrated care delivery within a hospital system will enhance the value of the partnership. Such initiatives epitomize the current philosophy and trend toward quality of healthcare vs. quantity of healthcare and support the clinical integration and free exchange of information among providers that is essential to the successful performance of value-based payment models. Today, Healthcare Administrative Partners (HAP) is pleased to report that this concept is now a reality. With the help of radiology practice leaders whom we serve as revenue cycle management clients, we have developed a custom clinical analytics system that hits all of these targets. Our initial solution focused on identifying incidental lung nodule findings and mailing communications containing recommended follow-up steps, consistent with the guidelines for the condition identified, to both the patient and his or her primary care physician. As a result, compliance with follow-up exams reached an average of 60% within the cohort. In over 20% of these patients, a potentially worsening situation was detected, prompting care intervention that otherwise may not have occurred. Our client’s team found that this new program is both good for patient care and good for building practice value. Most importantly, it connects the radiologists with patients in a way that reinforces the role of diagnostic imaging providers as proactive stewards of patient health. Likewise, it elevates and centralizes the role of the radiology group in optimizing quality of care within the hospital and health system. In our next article in this series, we will detail the results of the second phase of the deployment involving implanted IVC filters that require removal in certain instances. Additional case studies from HAP’s Clinical Analytics Services will be covered in upcoming blog articles. Subscribe now so you don’t miss them, or any of our updates on issues important to radiology quality improvement and reimbursement maximization. Sharon Taylor is the Chief Clinical Informatics Officer at Healthcare Administrative Partners. Attending RBMA Paradigm in San Diego? Join our presentation on Friday, April 6th, at 11 AM for the full story of how we overcame the data challenges to deploy the solution described above.